ARCATHANE ROOF WATERPROOFING is a liquid-applied, water based, modified polyurethane membrane used for long-lasting waterproofing of flat roofs and terraces with substandard slope. * Note:. The displayed colour will depend on your monitor and browser and certain colours cannot be shown adequately. To visualize the actual colour, ask us for our colour card. Used to provide a long-lasting waterproof membrane on roofs and terraces with 0% slope, ARCATHANE is a liquid, elastic modified polyurethane membrane based on innovative technology - long-chain polyurethane macromolecules are incorporated in a water medium forming stable dispersions. 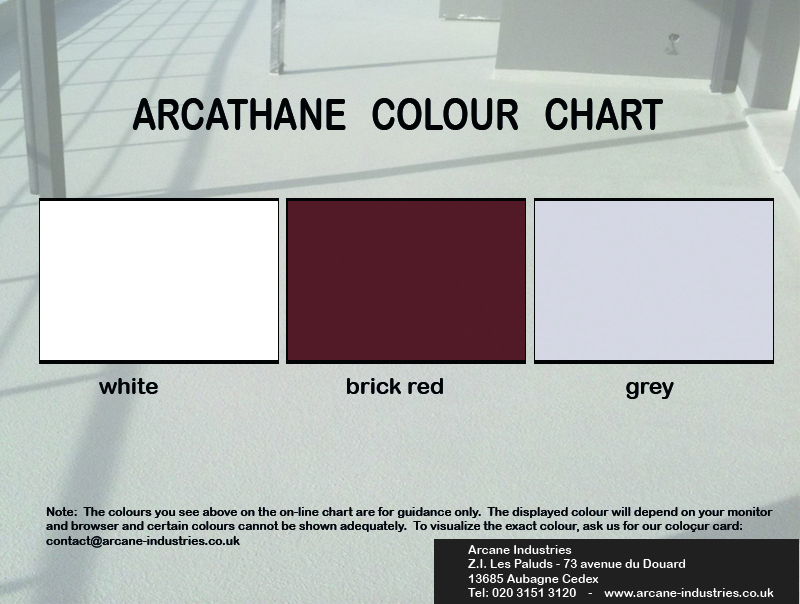 ARCATHANE offers the high level properties of solvent based products in an ecological, consumer and evironmentally friendly, water-based, low VOC, no ADR transport product. When waterproofing a roof or roof terrace having a minimum slope of 3%, ARCAROOF can be used. Do not apply in temperatures <5°C or >80°C, if wind, rain, freezing. Surfaces to be coated must be dry, clean, sound and free of all contaminants, loose particles, dirt and dust. The humidity of the substrate must not exceed 8%. Scrape and brush off all moss. The surface must be disinfected with a fungicidal product such as ARCAMOSS. Wait 24 to 48 hours before applying ARCATHANE to a treated surface. New concrete surfaces must have been left to dry at least 28 days before applying the ARCATHANE. Old surfaces must be levelled out before application (cracks and irregularities filled in with a polyurethane mastic). Careful sealing of existing cracks and joints before the application is extremely important for long lasting waterproofing results. Fill all prepared cracks and joints with a polyurethane sealant. Let dry min 48 hours. Apply with a paint brush or roller. 1st coat: Dilute the product with 5 to 10% water and apply. This % will depend on the porosity of your surface. Let dry 24 to 36 hours. 2nd coat: Apply a coat of undiluted product (as you would a paint). Let dry. Repaired joints, cracks or weak spots such as protruding pipes, internal angles, chimney flashings etc. must be reinforced with ARCAMESH. 2nd coat: to firmly embed the mesh and saturate the surface «wet on wet». Let dry 24 to 36 hours. 3rd coat: Apply a coat of undiluted product (as you would a paint). Let dry..
Can be stored in dry and cool rooms for up to 9 months. containers, bearing the manufacturers name, product designation, batch number and application precaution labels. Immediately embed Arcamesh in the freshly applied coat and press in to chase out any air.